Glentoran's summer clearout has begun with Ciaran Martyn, Johnny Taylor and Aidan O'Kane all being released by the cash-strapped club. Taylor was on loan at Ballymena United earlier this season and he is being linked with a permanent move to Glenn Ferguson's outfit. 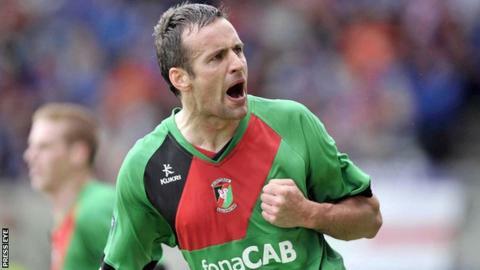 Martyn joined the Glens from Derry City in January 2010 but his Oval stint has been hindered by injury. Aidan O'Kane leaves after one season and 20 appearances for the Glens. Meanwhile, Cliftonville have signed goalkeeper Conor Devlin. The keeper moved to Manchester United as a 16-year-old and has also had spells at Aston Villa, Hartlepool and Brentford. Defender Barry Holland has also agreed a new deal with the Solitude outfit.